Author Isabelle Rae joins us today. Her book, When Summer Ends, was #2 in the "Children and Teens" category of the iBookstore on February 10th. Then it was back last Saturday at #4. Let's hear about her book and how she found e-pub success as an independent author. Isabelle, what's your book about? ‘When Summer Ends’ is a forbidden romance novel. Chloe Henderson, a seventeen year old High School student, uses a fake ID to gain entry to a club. It’s there that she meets the handsome and alluring bartender, Will Morris. The pair hit it off immediately and sparks fly. After spending the summer with him, she returns to school only to find out that Will is her new Calculus teacher… It’s a tale of love, heartbreak, friendship and rivalry. When I made the final decision to publish I knew the self-publishing route was the one I was going to take. I’d read articles about how hard it is to find a literary agent, and how the odds are kind of stacked against you from the start because of how many submissions they received each week. The thought of sending out manuscript after manuscript to agents was a little daunting, and not something I really wanted to get in to. I had heard of someone through a friend of a friend that had used Smashwords for publishing, so I looked into it. After reading up on independent publishing and what was involved, I decided to take the plunge and give it a go. After all, I had nothing to lose at all from it! When I first started writing I put my book on an amateur writing and reading site called Wattpad. It was there that I built up a steady following and fan base. In fact, my book had racked up over ten million reads on the site before I decided to take the plunge and publish it independently. I truly believe that my wonderful readers at Wattpad were the key to my success. When I published When Summer Ends I announced on my profile that it was available to purchase if my readers wanted their own copy. Once it was published it hit the top of the charts in four countries in the iBookstore in the first couple of weeks. My wonderful fans at Wattpad purchasing it made it enter the charts, and that then made it possible for other people to find my story. I guess word spread from there! Also, I think a great cover is important too. The person who made my cover, Mollie, is a friend from Wattpad. A great cover can catch the attention of readers and draw them in so that they read the description of a book. 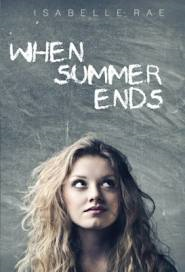 When Summer Ends is aimed at late teens, predominantly girls because of the romance base in the storyline. I love that the e-format is getting so popular at the moment. As technology grows and it seems that every teenage girl has access to some sort of e-reader, all be it iBookstore, Kindle, Nook or some other device, it’s easier to reach the target audience. As time goes on it seems that technology plays a huge part in children/teens’ lives, and I think this will only grow as the technology evolves even more. I love how a book is now just at the touch of the screen. Books in this format are so much easier to carry around, which is why I feel the e-format demand is growing so quickly. It has undoubtedly made it easier for me as an author to reach my desired reader! I think the e-book market will just get stronger and stronger as time passes. As I said above, my followers at Wattpad were the ones that gave me the initial boost into the charts; from there people just seemed to find my book on their own. I do have Facebook, and I’ve recently set up a twitter account (though I have no idea what I’m doing on there yet!) but I don’t actively advertise on there for sales. I have been incredibly lucky with regards to promotions that I’ve been included in. Mark Coker from Smashwords, the site I used for my e-publishing, has been a tremendous asset to me, nominating my book for Apple promotions as they come up. Recently I was included in two in the USA, ‘Breakout Books’ and ‘Readers Favourites’, both of these promotions ran at the same time and the extra advertising from Apple gave my book a huge boost in sales and propelled When Summer Ends to number 2 in the US iBookstore chart a couple of weeks ago. I have to say a massive thank you to Mark and his team at Smashwords who have championed my book with promotions that have obviously attributed to my success. Also to Apple who have been such a huge supporter of Indie authors. Their support makes all the difference, and for that I am incredibly grateful. You can get to know more about Isabelle and her book at Wattpad or by following her on Facebook or Twitter.